sensible & realistic approach to packaging. Comprised of a 100% wood free, recyclable shipping container directly attached to the LIFT™Pallet. 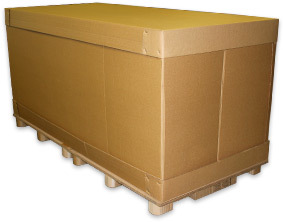 The compressed container can be as small as 11" high yet hold an expanded unit measuring 60" high. One piece lightweight unit that is user friendly. All components of the crate system fit inside the compressed unit until ready for assembly. Easy to load as walls can be placed independently.